Plans to test geophysical targets from borehole survey over a 200m strike length. Callinex Mines Inc. (the "Company" or "Callinex") (TSX VENTURE:CNX)(OTCQX:CLLXF) is pleased to announce that assay results have confirmed a high-grade copper and zinc rich VMS discovery ("Pine Bay East") at the Pine Bay Project located near HudBay's 777 Mine and processing facilities in Flin Flon, Manitoba. 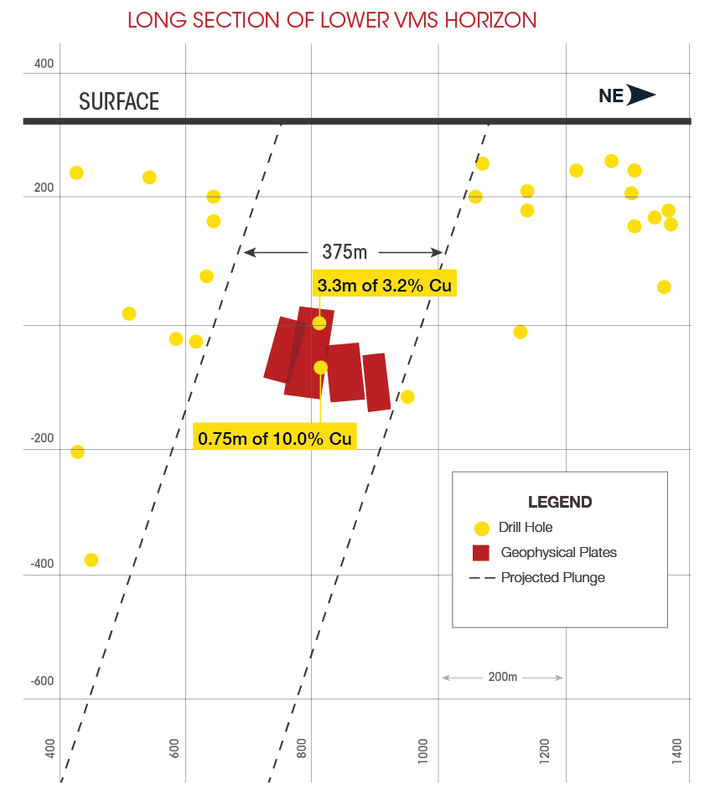 The discovery hole, PBM-008, intersected 3.3m of 3.2% copper and 5.9m of 2.2% zinc and is located 450m east of the historic Pine Bay deposit and mine shaft (See Figure 1). The Pine Bay East discovery is open along strike in both directions and at depth, where no previous drilling has been completed (See Figure 2). Callinex plans to conduct additional drilling to intersect mineralization over an approximate 200m strike length during the current winter drilling campaign. President and CEO Max Porterfield stated, "We are excited to announce a new discovery within one of the largest past-producing Volcanogenic Massive Sulphide ('VMS') camps in the world. With the additional planned drilling we have the potential to identify high grade copper and zinc mineralization along a strike length that is consistent with historic mines in the camp." Mr Porterfield continued, "We are looking forward to additional drilling at our Pine Bay East discovery along with assay results from a recently completed hole to follow-up on the Sourdough discovery from our summer campaign." The new Pine Bay East zone is highly prospective given it is located at the margins of the Baker Patton Felsic Complex, one of the largest and most highly altered package of felsic volcanic rocks within the Flin Flon Greenstone Belt. Nearly all deposits in the Flin Flon Greenstone Belt are hosted within felsic volcanic rocks, the largest accumulations of which are often directly associated with major alteration systems such as those found near the 'giant' Flin Flon and Chisel Basin VMS deposits. For additional information on the new Pine Bay East zone please contact the Company's Investor Relations department at 604-605-0885 or view the news release dated February 10, 2015 titled "Callinex Discovers New Massive Sulphide Zone Near Flin Flon, Manitoba". The Company anticipates releasing additional assay results from the 2016 winter drilling campaign over the coming weeks. To date, nine of ten planned holes have been completed with assays pending for eight holes. (1) Drill composites were calculated using a cut-off 1.0% for copper, 1.0% for zinc and 1.00 g/t for gold over a minimum down-hole length of 0.4 meters. True widths are not currently known. (2) MS = Massive Sulphides, SMS = Semi Massive Sulphides, DSS = Disseminated Sulphides and Stringers. (3) Dip and azimuth for hole PBM-008 is -65° and 300° Az. The diamond drill hole is located at the following Universal Transverse Mercator (UTM) coordinates using the North American Datum of 1983 (NAD83) within UTM Zone 14N: 332533m East and 6071605m. North. The collar of the hole is 329m above sea level. (4) Numbers may not add due to rounding. SGS Canada Inc carried out some or all of following methods to obtain the assay results for Callinex: G_LOG02 Pre-preparation processing, G_WGH79 Weighing and reporting, G_PRP89 Weigh, dry, crush, split, pulverize, G_SCRQC QC for crush and pulverize stages, G_CRU22 Crush >3kg, G_DRY11 Dry samples, GE_FAA313 @Au, FAS, AAS, 30g-5ml (Final mode), GE-IC14A Aqua Regia digestion/ICP-AES finish, GE_IMS14B Aqua Regia digestion/ICP-MS package, GE_IMS14 Aqua Regia digestion, GO_FAG303 30g, Fire assay, gravimetric finish (Au)(Final Mode), GO_FAG313 30g, Fire assay, gravimetric finish (Ag)(Final Mode) and G0_ICP13B Ore Grade, Aqua Regia digest/ICP-AES. Ag >10ppm was analyzed by ICP. The technical content of this news release has been reviewed and approved by James Pickell, P.Geo, a Consultant to the Company, and a Qualified Person as defined by National Instrument 43-101. The Pine Bay Project is located 16km east of HudBay's 777 Mine and processing facilities near Flin Flon, MB. The project area spans 6,000 sq. ha. and covers a significant portion of the Baker Patton Felsic Complex, one of the largest and most highly altered packages of felsic volcanic rocks within the Flin Flon Greenstone Belt. Historic exploration activities have outlined four mineral deposits, three of which are located within a mineral lease that has advanced permitting status and includes the right to conduct mining activities. The Pine Bay deposit, the largest of the four historic deposits, has a 212m vertical shaft with significant underground workings from previous exploration activities. The project has two distinct areas with VMS mineralization, the northern Pine Bay area and the southern Sourdough area. These areas are each related to historic deposits and occur along an approximate 10km NE-SW VMS trend near the top of the Baker Patton Felsic Complex. The Sourdough area is immediately adjacent to HudBay's past-producing Centennial Mine. Callinex has recently intersected new VMS zones in both the Pine Bay and Sourdough areas. During the 1990s, majors including Placer Dome Inc. and Inmet Mining Corporation conducted limited exploration programs in the Pine Bay area to define a large VMS deposit at depth. A review of historic work has confirmed that several proposed drill holes and targets outlined by Placer Dome were never completed. The property position was recently consolidated for the first time combining several large claim blocks previously operated by companies including Placer Dome, Inmet, Newmont, HudBay and Cameco. Prior to Callinex's modern geophysical and geological exploration programs, very limited work was conducted between 1996 and 2014. Callinex has digitally compiled more than 1,000 mostly shallow drill holes and has completed large airborne and ground geophysical surveys to identify and evaluate the most prospective drill targets. (2) Historical resource estimates include (a) a Cerro-Mining-Guggenheim Joint Venture report titled "Feasibility Study for 550 ton per day mine & mill", prepared by Wright Engineers Limited in 1971, reported a "geological ore reserve" 1,113,200 tons at 2.76% Cu at the Pine Bay deposit, (b) a Keys report in 1963 reported a historical resource estimate of 291,150 tons at 1.46% Cu at the Sourdough deposit, (c) a Pine Bay Mines report in 1976 reported a historical resource estimate of 125,000 tons at 0.84% Cu at the Cabin deposit and (d) a Macmillan report in 1968 reported a historical resource estimate of 95,000 tons at 0.80% Cu at the Baker Patton deposit. The historical "geological ore reserve" and resource estimates cited above is mentioned for historical purposes only and uses terminology not compliant with current reporting standards. The reliability of these historical estimates is unknown but considered relevant by the Company as it represents a significant target for future exploration work by the Company. The assumptions, parameters and methods used to calculate this historical resource estimate are not known to the Company. The qualified person has not made any attempt to re-classify the estimates accordingly to current NI 43-101 standards of disclosure or the CIM definitions. In order for these resources to be current, the Company will be required to conduct additional drilling on the Pine Bay Property. The Company is not treating this estimate as current mineral resources or mineral reserves as defined in NI 43-101. Although the Historical resource estimate was also designated as "ore" it cannot be compared to mineral reserves as it is not supported by at least a current pre-feasibility study. (3) Copper equivalent grades are based on metal prices of: copper US$3.00/lb, zinc $1.00/lb, gold US$1200 per oz, silver US$20 per oz. Metal recoveries of 100% are applied in the copper equivalent calculation. The copper equivalent calculation is as follows; Cu Eq = Cu grade + ((Zn grade%/100*2000 x Zn price) + (Au grade/32.15 x Au price) + (Ag grade/32.15 x Ag price)/Cu price/20). 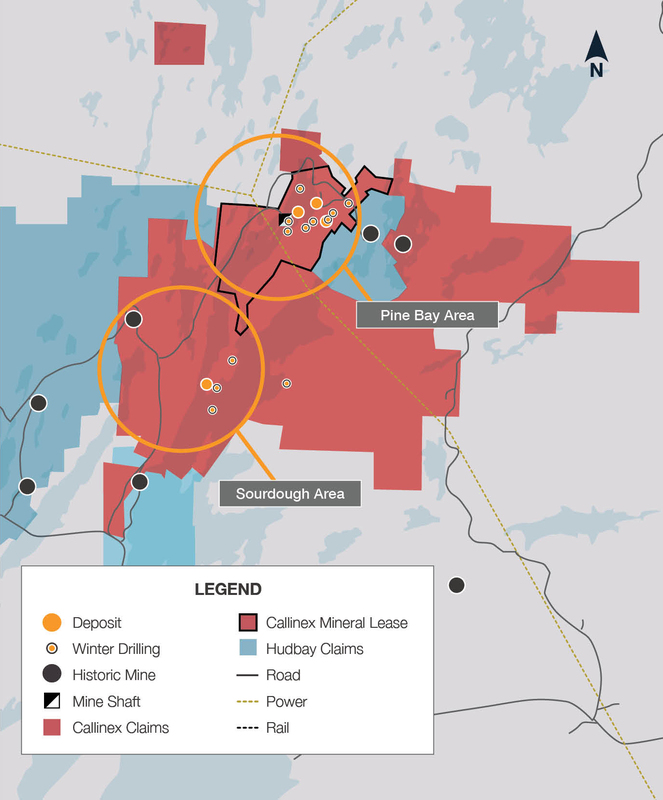 Callinex Mines Inc., a Canadian mineral exploration company, is focused on discovering the next copper-zinc rich VMS mine within Manitoba's prolific Flin Flon mining district. The Company's flagship project is the Pine Bay Project which hosts significant historic VMS deposits that are within close proximity to a processing facility. The Flin Flon district has yielded more than 145 million tonnes of production from 32 mines. Some statements in this news release contain forward-looking information. These statements include, but are not limited to, statements with respect to future expenditures. These statements address future events and conditions and, as such, involve known and unknown risks, uncertainties and other factors which may cause the actual results, performance or achievements to be materially different from any future results, performance or achievements expressed or implied by the statements. Such factors include, among others, the ability to complete contemplated work programs and the timing and amount of expenditures. Callinex does not assume the obligation to update any forward-looking statement. About this company Callinex Mines Inc.